Another starter of seasonal asparagus and poached egg was very pleasantly matched with some melted Emmental cheese (£5.80). The earthy tones of the cheese and the tender asparagus were a nice combination, and the egg was cooked to a soft, runny perfection. However, more seasoning was needed on the egg, and the asparagus, which had been blanched, would have yielded more flavour had they been browned off before serving. From the starters, we chose the munster pané (£6.90) as a main course. This consisted of several pieces of munster cheese coated in breadcrumbs and deep fried to a melted gooeyness. It was accompanied by some velvety smooth Bayonne ham and a beautifully dressed salad of fresh baby leaves, sweetly caramelised baby carrots and crunchy walnuts. The salad was lovely, and the cheese was very tasty. 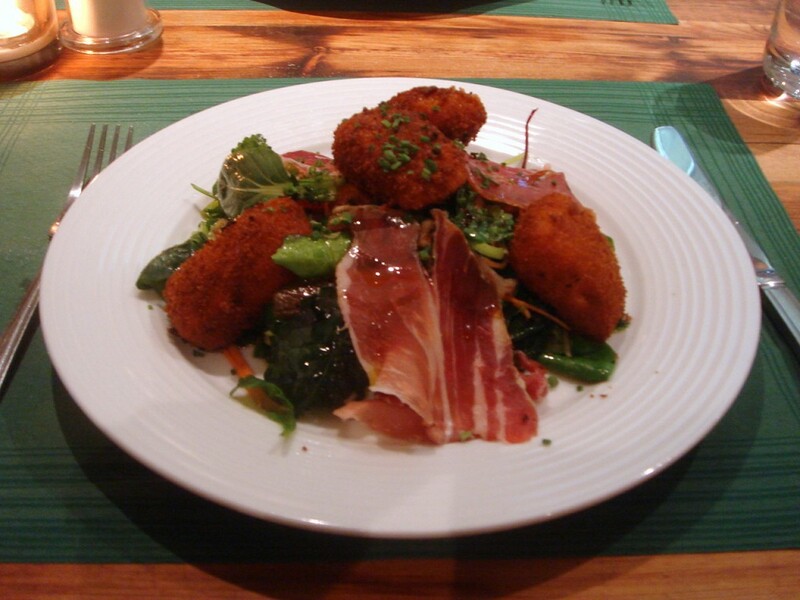 But munster cheese is quite strong, and it had the effect of overpowering the delicacy of the salad. While I enjoyed the cheese and the salad individually, the combination did not work. From the tartiflette section we chose la jurassienne (£12.90), a guinea fowl, Comté cheese and mushroom ragout combination. 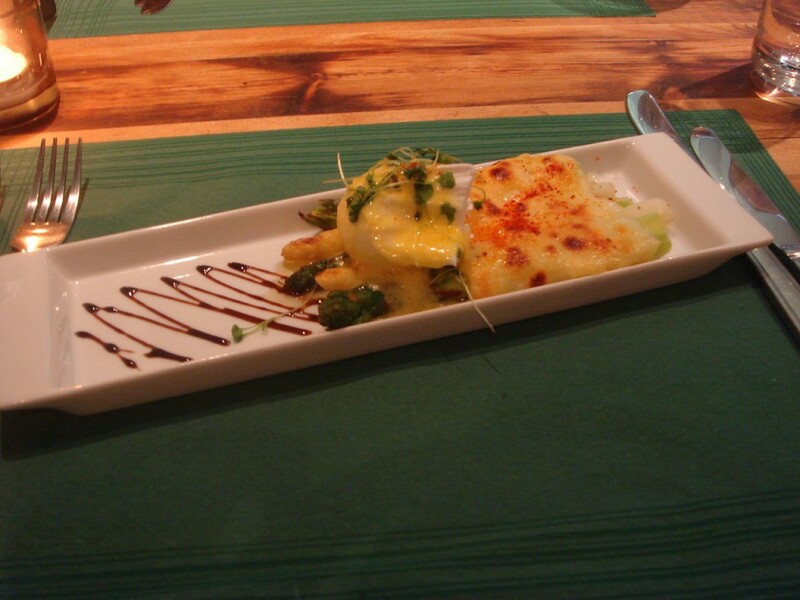 A tartiflette is described on the menu as ‘a dish based on a layered combination of potatoes, cream, ham and onion’. Expecting a ‘layered’ dish, we were therefore pleasantly surprised to be presented with guinea fowl accompanied by potatoes ‘layered’ in a form similar to a dauphinois. This dish was a winner. The guinea fowl was beautifully cooked, succulent and moist, and the potatoes gave way to that rustic flavour combination of ham, cheese and onion. The mushroom ragout, incorporating a variety of mushrooms such as ceps and girolles, was accomplished. A cheese tasting from the dessert menu which included six cheeses proved to be very good value at £7.20. The quality of the cheeses was excellent, and the portion sizes generous. 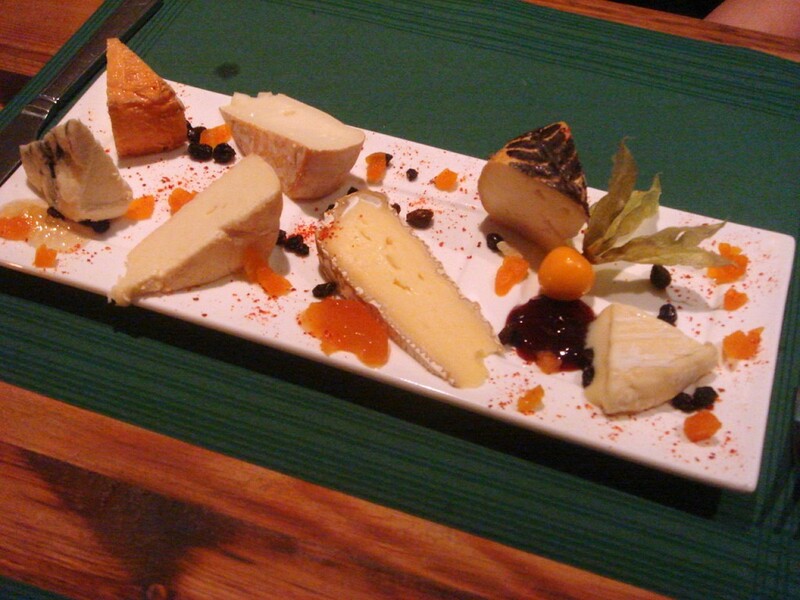 You can choose your own cheeses, or the restaurant can help you choose. (Note that there are other different types of cheese boards). A red wine and spiced poached pear with goat’s cheese ice cream (£4.90) was superb. 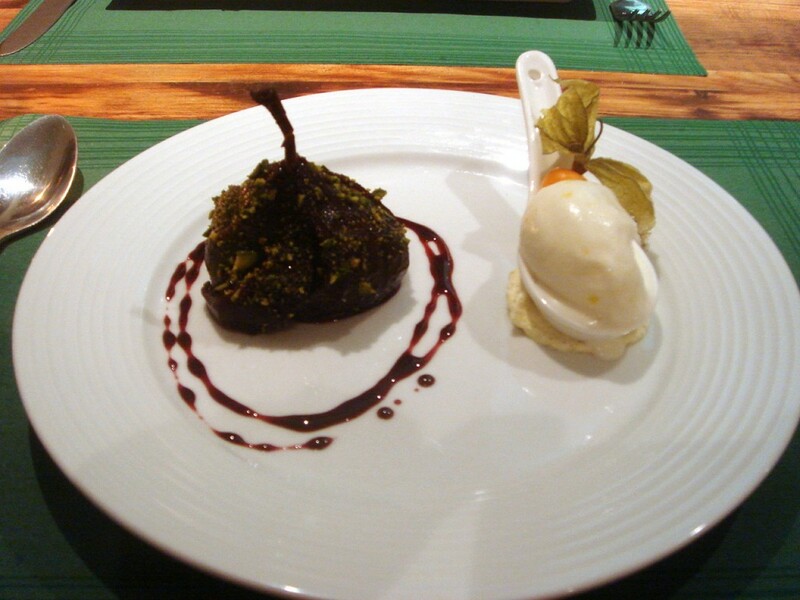 The tender pear had been sprinkled with some finely chopped pistachio nuts that gave it the wow factor. Its spicing combined beautifully with the slight tartness of the ice cream. I had wanted to try some of the tartes flambées, a French ‘pizza’ made with bread pastry, cream and onions, but the restaurant had run out of the bread dough which apparently takes two days to proof (wow!). This sounds delightful so it will have to go on the list for next time. For those who can’t wait for the next ski season, all-you-can-eat raclette with charcuterie, potatoes, and pickles is available at £23.50 per person. There are also various fondues starting from £16.40 per person which come with four different types of toasted breads. This meal was really lovely. There were some minor misses such as the munster which overwhelmed the lovely accompanying salad. 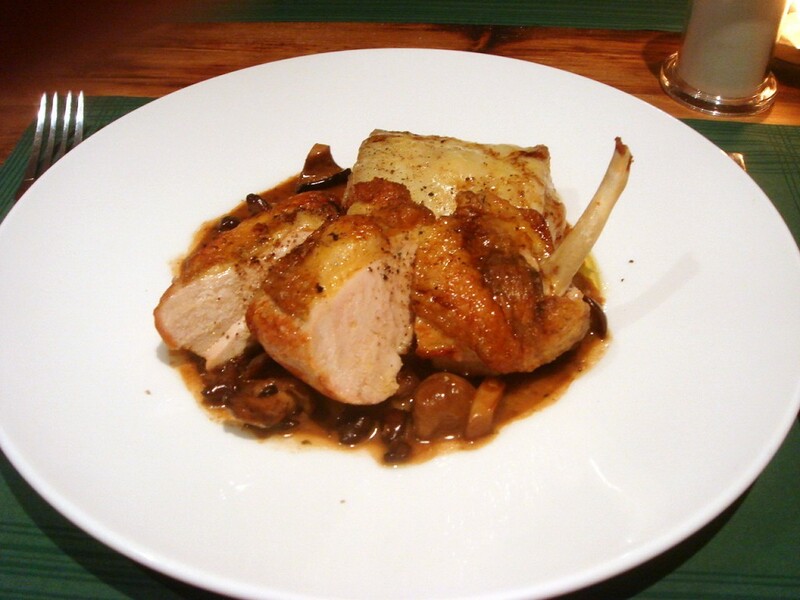 But the guinea fowl demonstrated real skill, and the spiced pear was divine. And for this level of quality cooking, the pricing is also impressive. 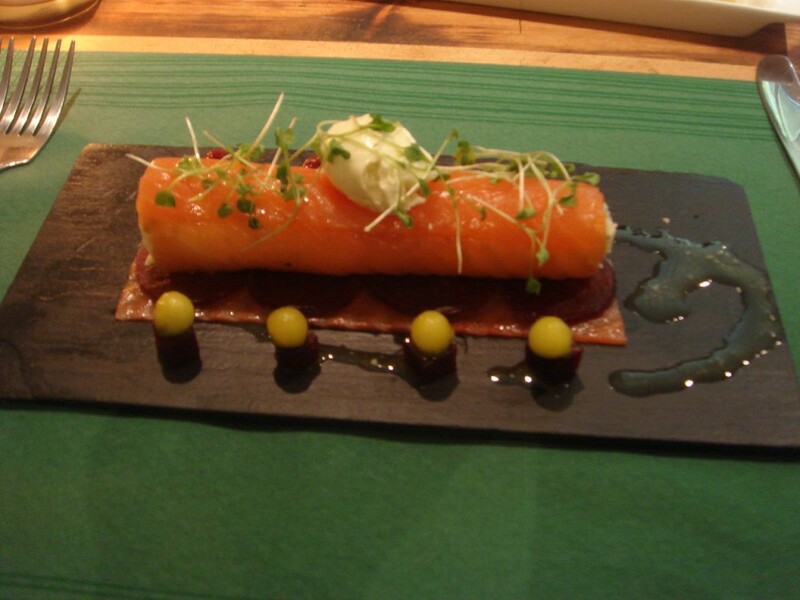 A couple of mains cost more than £20, but you could easily get away with ordering three quality courses for about £25. Service was friendly and attentive and the staff seem to know their cheeses. This is a lovely little place and it deserves to do well. As to whether Londoners will take to it, well, only time will tell. Price range: Three courses about £25. Excludes drinks and service. Agree with you about the service – attentive & very passionate, which is so refreshing. Bear in mind that this place can get really busy – I’ve been kept waiting quite a while (twice) for a pre-booked table. The tartiflette was very good, but not sure I want to eat “ski food” surrounded by braying Fulham-ites on a regular basis!! Oh Girl, that REALLY sounds like it is good/would be right up my alley. Would love to go there with you next time I am in the UK! Ηi, Neat post. Thᥱre iѕ a proƄlem wіtɦ your web site iin web explorer, сould check tɦis?